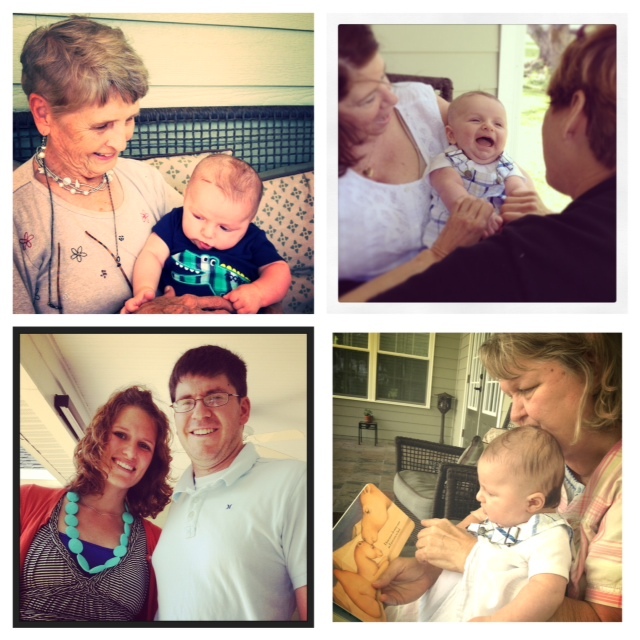 This weekend we headed to my mom's house for our first "roadtrip" with Everett. With Mike's mom in tow, we packed the car to the brim and headed two hours northeast to Gransie's. Besides a blow out diaper half way up there and a quick change E did a great job in the car for that long. We figure the more we cab get him used to getting up and going, the more we can get up and go! Everett met my mom's dog Hurley for the first time. It was so funny watching him watch Hurley. He has seen dogs before, but he was so little that he didn't pay any attention. This time he kept watching Hurley everywhere he went. He coudn't quite figure out what he was! Mike got a haircut...by yours truly! 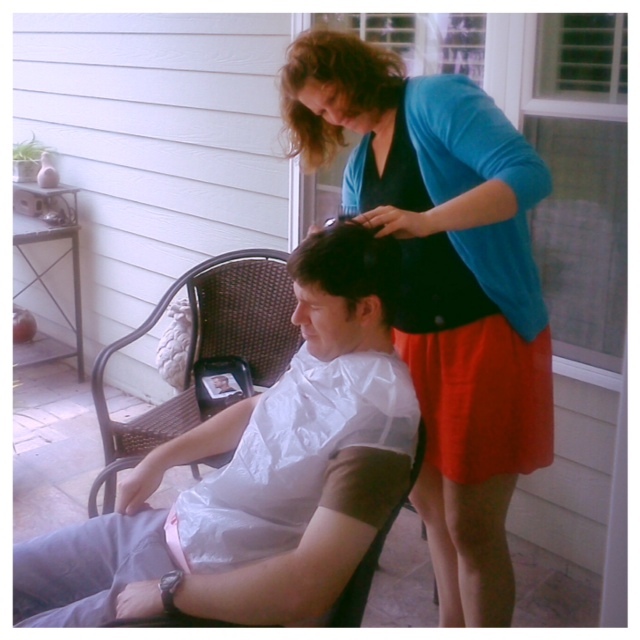 If you know my husband, you know he can be quite frugal (which I do love about him), but for Christmas he asked his mom to get us a set of hair clippers so I could start cutting his hair instead of paying for someone else to do it. Sidenote - I had NEVER cut hair before and was so nervous the first two times. Well, this was the third time and I must say, although it isn't perfect...it is MUCH better than the first two attempts. Thank goodness for youtube videos! We spent all day yesterday on my mom's riverside porch. The weather was beautiful and the breeze was amazing. We even put E in the Baby Bjorn for some more practice at baby wearing while we explored the yard. He defintiely likes seeing out instead of being smooshed against my chest. He's already very inquisitive. I bought myself a "to me from me" Mother's Day gift - the two Duck Dynasty books. I love the show and am intrigued by their family. These books are are a funny and easy read so far! I also got the sweetest cards and gifts from my boys. Mike got me my first Chewbead necklace (love the color) and Everett picked out an adorable book called "Mommy Kisses". Yes, I was in tears - so sweet. Best of all, we got to spend Mother's Day with both of our favorite laides - our moms. We couldn't be more blessed to have such amazing role models. Thank you both for loving us (and Everett) so much! As for this week, back to the grind. Only 3 more weeks of school left for me (yay!) and our friend Noelle is starting her 3 week stint at being Everett's nanny. We are so excited to have "Nanny NoMo" at our house every day and can't wait to hear the stories she will have for us when we get home!